When an electric car catches fire, you can’t treat it like an internal combustion car. You need a lot more water and you can’t store the car afterwards in a similar manner, either. Dealing with EV fires is something that more and more firefighters are going to have to learn as the number of these cars on the road only increases. There are an estimated 760,000 electric and plug-in cars on U.S. roads, says the International Energy Agency, and only about a quarter of our firefighters have had some kind of EV training to know what to do in case of a fire, reports Bloomberg in a very excellent feature. To clarify, Bloomberg also makes sure to note that, “Electric vehicles are no more prone to accidents or fires than gasoline-powered cars—and might be less so, according to a 2017 report by the National Highway Traffic Safety Administration.” The issue reportedly lies in the fact that the technology is still very young and evolving and there really isn’t any agreement on safe system design. Tesla also includes an entire first responders information page on its website, which instructs firefighters and other emergency crew on how to deal with a potential vehicle fire. It can take about 3,000 gallons of water, applied directly to the battery, to fully put out and cool off a battery fire, Tesla explains. If there isn’t any water on hand, use dry chemicals, carbon dioxide, foam or some other typical extinguishing agent until water can be accessed. Always advise second responders that there is a risk of battery re-ignition. Due to potential re-ignition, a Model S that has been involved in a submersion, fire, or a collision that has compromised the high voltage battery should be stored in an open area at least 50 ft (15 m) from any exposure. 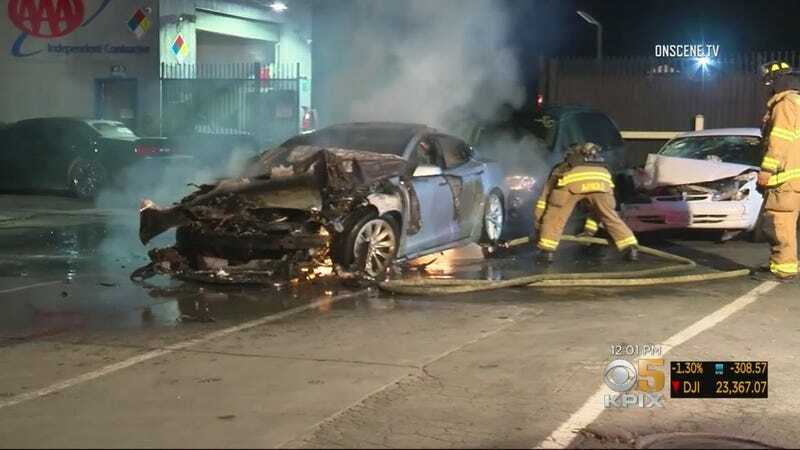 We’ve seen this happen recently, when a Model S caught fire twice in one day. Tesla has actually worked extremely closely with first responders to help teach them how to combat EV fires. The company has donated “hundreds of vehicles” to the local fire department in Fremont, California, where its factory is located, so that the Fremont Fire Department can provide classes for emergency personnel from around the U.S.
With the number of EVs on the road only expected to grow, it’s vital that responders know how to deal with them. You can read the rest of Bloomberg’s story here.